Happy Wednesday.. Man I cannot believe this week is half over already!!! That's ok though because I'm ready for the weekend.. lol Today it's all about Mistletoe Kisses! 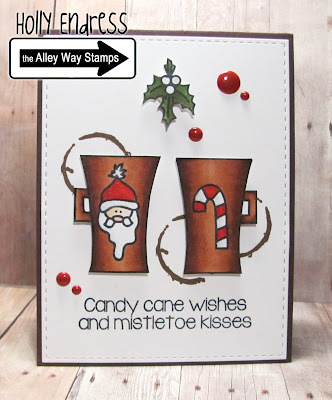 I created a fun Christmas card using one of the newest sets from the Alley Way Stamps called Mistletoe Kisses. I stamped the cups from Breakfast Club onto a piece of White card stock and then I stamped the Holiday images from Mistletoe Kisses on each cup and colored them in with Copics. Then I fussy cut them out. I die cut a piece of card stock using a Stitched Rectangle die and then I stamped the coffee stains using some Walnut ink. I added the cups with some dimensionals. I stamped and cut out the Mistletoe as well. I stamped the sentiment using some black ink and mounted the image panel to a Chocolate Chip card base. I wanted to bring in a little more red so I added some Holly-berry gumdrops. 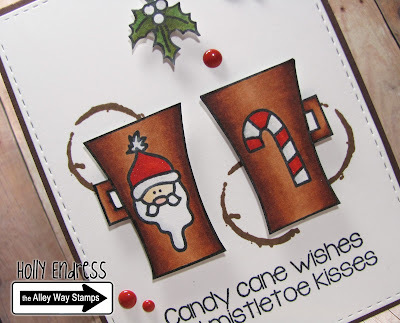 Head over to the Alley Way Stamps Blog for some more great inspiration... See ya tomorrow! This card is so great I cased it here: http://floridaredhead.blogspot.com/2015/12/peppermint-everything.html. Hope you don't mind, ellen.